The 2018 Edition Piece is the Trademark Pitcher. Belleek's famous trademark appears in relief on both sides and features icons of Ireland - the round stone tower, a harp, an Irish wolfhound and shamrocks resting upon the Belleek banner, a symbol of the island itself. This detail is flanked by grasses and reeds found along the marshes in the County Fermanagh Lakelands near the Pottery. 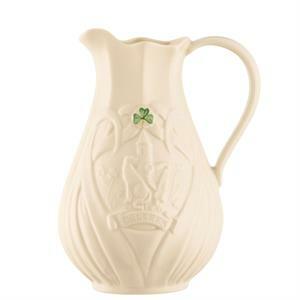 One hand-painted shamrock, a classic touch of Belleek, is added atop the design at the front. This beautiful pitcher stands at 6.5" tall and 5.5" wide wwith the handle. It has a capacity of 25 fluid ounces. It is a perfect addition to the 2017 Edition Piece, the Trademark Vase. The exclusive Belleek backstamp found on the base of the pitcher includes the signiature of its designer - Catherine Townsend. The mould will be retired from production at year end.